Transferring the backup data from the local Backup Server to OffsiteDR for disaster recovery purpose via LAN or WAN is always a time-consuming process and also transferring of huge data by the network will consume a lot of bandwidth. Network interruption during data transfer will still consume a lot of your resource and make the disaster recovery setup even more complex. 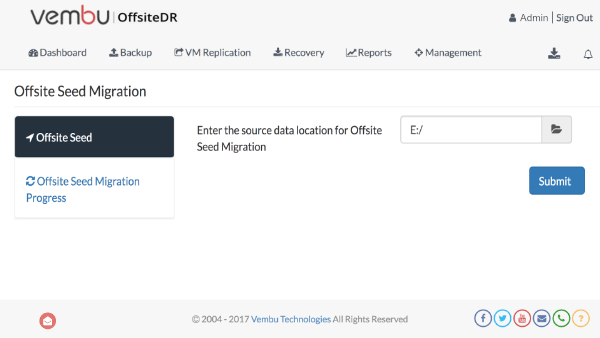 Using the Offsite seed migration of Vembu, the initial data transfer from backup server to OffsiteDR server can be migrated using a local storage medium, while the incremental data can be transferred through the LAN or WAN.This saves a lot of time and bandwidth required to transfer the data over a network.